During my placement at Cardiff University I created an iOS and Android application called Show me where. The application is aimed at helping autistic children describe parts of their body. It works by allowing users to slide different body parts across the screen onto a virtual doll and then outputs the relevant audio telling the user which body part they moved. You can view a video demonstrating how the app works and how it has affected peoples lives here. The application is available on tablet and can be downloaded the Show me where app from both the App Store and Google Play Store. Stuart started working on our App project, ‘Show me where’ during his first week of employment with the Cardiff University Web Team. As novice developers, Irene Hammond and myself were very impressed with Stuart’s knowledge and technical advice regarding the design and usability of our product, explaining clearly about navigation, functionality, use of audio, and orientation etc. Based on his advice we exchanged ideas and made changes, which he implemented quickly and professionally. When the App was complete he took us expertly through the long-winded procedure of publishing ‘Show me where’ on the App store and dealing with various revisions requested by Apple, to successfully publish our App in April 2014. Since then Stuart has redesigned the App for the android market and has successfully published ‘Show me where’ on Google Play. Both, Irene and I have really enjoyed working along side Stuart and are very grateful for his patience and hard work, without him we wouldn’t have achieved so much within a year, we’ll miss his expertise! Best wishes for the future, Stu! Fantastic App – worth every penny!!! I use this regularly with my daughter Olivia. Olivia is 10yrs old and has cerebral palsy. This has helped immensely with her body awareness and communication. Both mine and Olivia’s anxiety levels when unwell have disappeared, it has changed our lives for the better she is full of smiles and more confident. Thank you for this wonderful App. This is such a good app! Why hasn’t this app been created before!!!!! This app is fantastic! So easy to use. 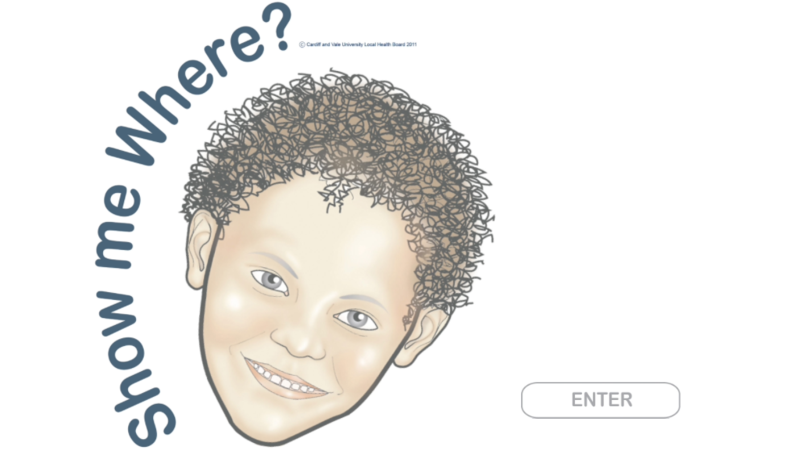 We are an after school club and this app is very useful at letting the children explain where they are in pain too! We recommend it to everyone as it is such an important part in helping children communicate! Amazing and a must have app! I use this on a daily basis with children who have various disabilities and would highly recommend it to anyone who has a family member or friend that has difficulty with communicating.